The Ebers papyrus tells us the Ancient Egyptians had an interesting way to deal with noisy crying babies: just give them a draft of opium. This practice was still very much use in the Victorian era, when it gained notoriety for the dangers the use of children’s opiates posed to general health. 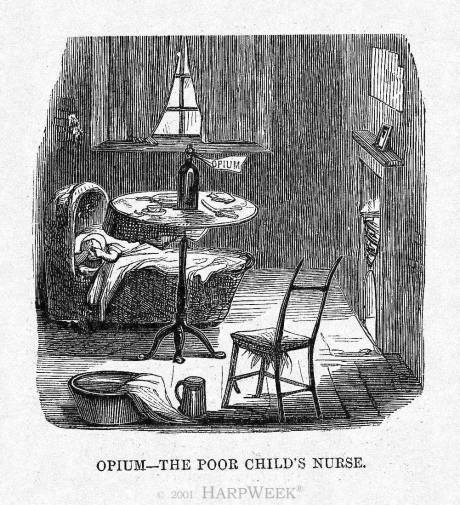 "The Poor Child's Nurse" from an 1849 issue of British humour magazine Punch. Source: HarpWeek. We know in this era opium was readily used as a cure for a bad cough, or aches and pains, but it is less well known that opium was also given to children, and even babies. Restless or teething babies and small infants would be given concoctions such as Mrs. Winslow’s Soothing Syrup, which contained morphine (an opium derivative). There were at least ten brands of mixtures aimed at children and infants including Atkinson’s Royal Infants’ Preservative, and Street’s Infants Quietness. The most famous preparation of children’s opiates was Godfrey’s Cordial, which was a mixture of opium, treacle, water and spices. A glamourised and seemingly tranquil card advertisement for Mrs. Winslow’s Soothing Syrup. Source: University of Buffalo. Medical Officers during this period were convinced that opium was a major cause of infantile death, with the use of opium becoming widespread amongst working class families. Opium was often described as the ‘Poor Child’s Nurse’, due to its ability to stop hungry babies from crying. Attitudes towards the administering of opium to children were often casual, with preparations such as laudanum and paregoric stating recommended doses for children and infants on the labels of bottles. The label on the back of this bottle of Stickney and Poor's Paregoric states dosages for infants as young as five days old. Source: University of Buffalo. One Manchester druggist even admitted to selling between five and six gallons of “quietness” every week. That’s around 24 pints! Opium caused infant mortality through starvation rather than overdose; as one doctor stated that infants ‘kept in a state of continued narcotism will be thereby disinclined for food, and be but imperfectly nourished”. The scale of infant mortality at the time was not fully known, as coroners often recorded the cause as ‘starvation’. Lozenges or pastilles containing opium were often displayed within pharmacy shop cabinets in rows, very much like a candy shop. Rows of jars for pastilles with various ingredients, including one for 'Liquorice & Chlorodyne', on display in the Gibson & Son Pharmacy at the Science Museum, Lower Wellcome Gallery. Source: Science Museum. This article was written by Kristin Hussey and Luke Pomeroy, Collections Information Officers.